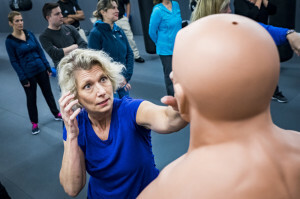 Flight attendant Gina Hernlem, 55, takes part in a self-defense seminar Dec. 2 near Dulles International Airport. More than 11,000 crew members nationwide have taken the Transportation Security Administration's voluntary four-hour course. Flight attendant Gina Hernlem, 55, takes part in a self-defense seminar Dec. 2 near Dulles International Airport. More than 11,000 crew members nationwide have taken the Transportation Security Administration’s voluntary four-hour course.